Copyright disclaimer: I, Steve Die (Rob), give this collection of information freely to RangerForums.com and do not condone its publication or sale without my express permission. I, Steve Die (Rob), do not own the patents on any of the products featured in this guide; all visual representations and their associated product names/vendors are owned by said companies. If any of these vendors disapprove of their product visually represented/mentioned please inform myself, Steve Die (Rob), and I will remove them from this guide and will generalize such products. Disclaimer: Neither I nor any member of RangerForums.com assume responsibility of any damages or monetary loss due to vehicle down-time. This guide is a form of guidance only and not a definitive truth because all vehicles even with same make, model, and year can have different outcomes. 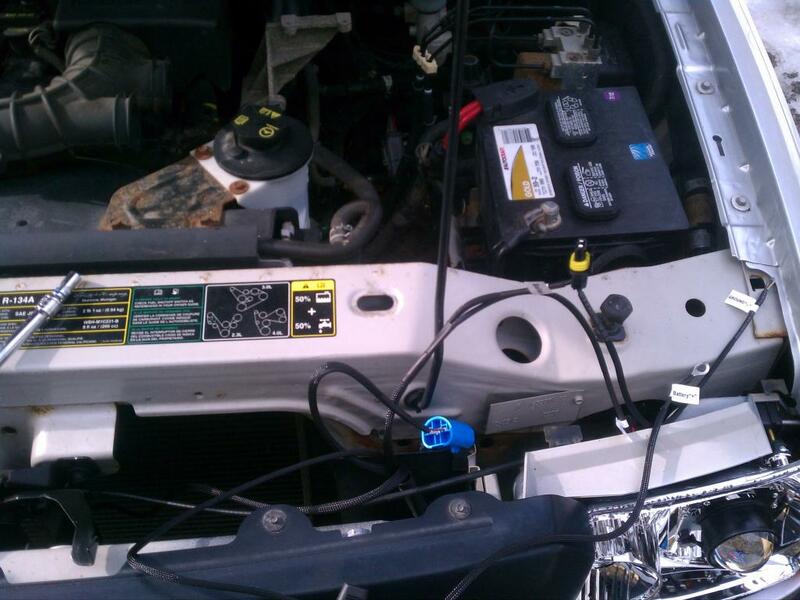 This retrofit was done on a 2004 Ranger Regular cab base model. Any forum user who has more in-depth knowledge and wishes to correct me on anything I have written here I implore you to let me know so I can make the necessary changes. All the information I have included here was through my own research and asking questions and not to mention my @#! * ups. I do not wish to publish misinformation. I have a twenty-five page text file (Word 2007) that explains in greater detail what I went through for those who wish to read it. I feel it has a lot of good information. At the time I have no way to share it, until then the abridged forum post will have to suffice. Pre-Mod preparations: You will need a pair of HID ballasts, bulbs, projectors, and a MotoControl harness to begin your retrofit. Other supplies will include some clear silicone (recommend buying butyl rubber when you order your other stuff), foil tape, JB-Weld, rotary cutting tool and tape or other means of holding a lens and headlight unit together while drying. I recommend also having new headlights to use. It keeps the down time of the truck to minutes rather than hours or days it also gives you crystal clear lenses as a finished product. Step 1. Start by taking your MotoControl harness and find a suitable mounting place. You don't want to put it to close to the engine or the radiator, think cool and dry. Do the same for your HID ballasts. I have a picture of what I set up. The boxes are mounted near the battery and I ran the cables through the front K-member and in the front to reach the passenger side.Be sure to run them underneath the K-member, don't want the hood closing on the wires. I have them run underneath with the positive battery temporarily hooked up in this picture. Step 2. Take the positive ring terminal and connect it to your battery. Do NOT connect the negative ring terminals to the battery. Take the two negative ring terminals and mount them to a suitable ground. I recommend taking a wire brush and removing the paint from a portion of the frame and use self tapping screws to securely hold it in place. 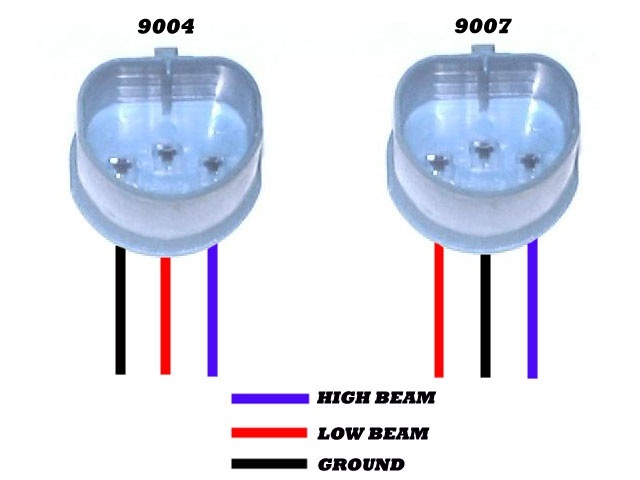 You can also connect your HID ballasts to the harness. Depending on your vehicle you may have to swap pins around in your MotoControl harness to become compatible with your vehicle. The below pictures show what my plug arrived to me as, a 9004 set up. I need 9007 so I had to swap the pins around before connecting it to the driver side headlight plug. Step 3. Gather your headlights to your work location. Pre-Heat oven to about 250 Degrees, the exact temperature will depend on your oven. Do NOT leave it on when headlights are baking nor walk away. 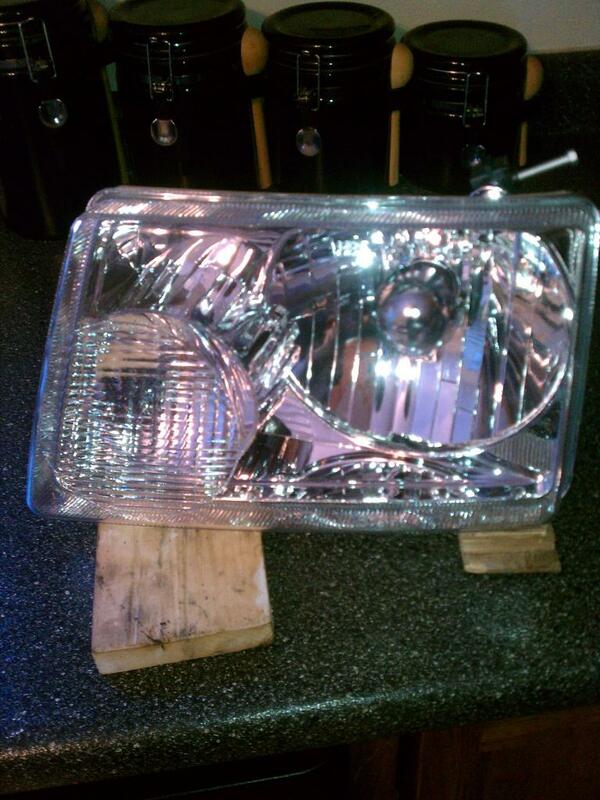 Insert one headlight unit on some scrap wood as shown below and bake for 10-15 minutes. Using a flat blade screwdriver pry the corners apart and work your way around carefully. 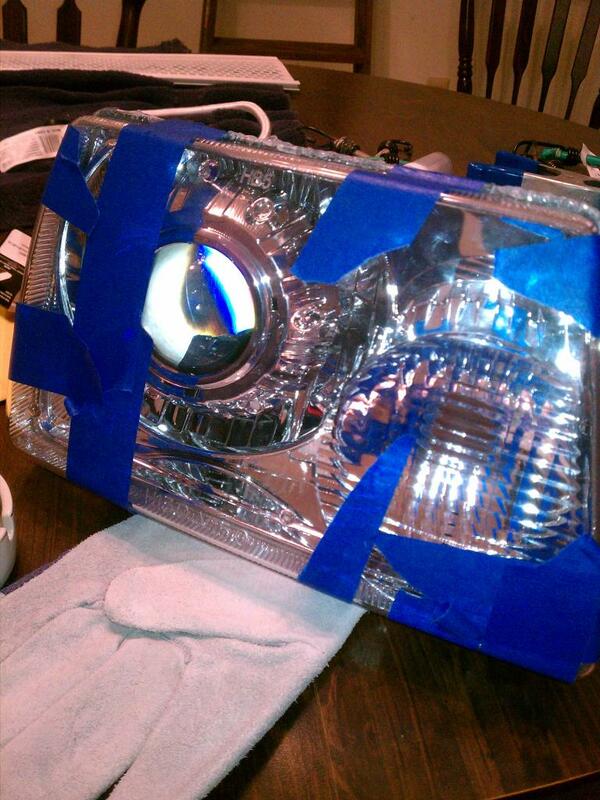 Remove ALL the glue in the recessed portion of the headlight unit and off the lens. You need to be able to seat the lens into the housing completely without issues. Step 4. Next is to mark the portion you will cut with your Dremmel or similar cutting tool in order to make the projector fit. Make sure you start out small; it doesn't need to be too large. In hindsight I should have used that "Bulge" what the reflector cup was mounted in as the level portion of the cut since the projector has the partially flat bottom. Keep gradually making the hole larger until you fit the projector in level with the lens pushed back on to make sure it clears it. You don't want the lens touching the hot projector lens; it will melt! Just keep putting the lens back into place and adjust the hole accordingly. If you can get at least a quarter of an inch space that should be good. The next photo shows the circle I drew to cut. Once again, I should have started further down. You may also have to cut out a small section so that your Bi-Xenon solenoid wires can be fed through if you are using Bi-Xenon projectors. Step 5. Now that you are sure you will not melt the lens because it's touching it's time to line these puppies up and secure them in place. I used aluminum foil tape to hold this in place. That alone worked pretty well, easy enough to remove to realign. Park about 25 feet away from a wall with your headlights hooked up and turned on. Make minor adjustments to the projector to get the cut-off line 2 inches below your projector mounted height. For example if from the ground to the center of your projector is 48 inches the cut-off line should be 46 inches. Step 6. Now that you have your projectors aligned you can finish them up by using the JB-Weld to secure them. 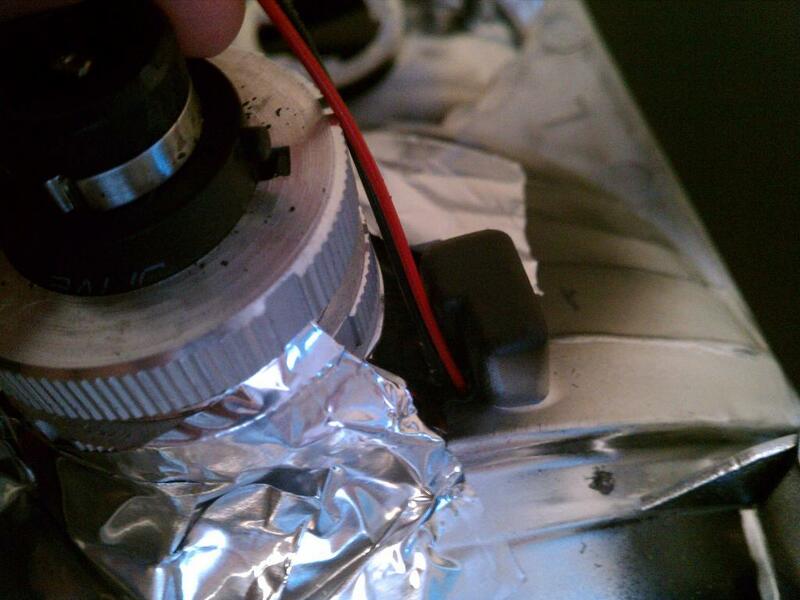 Mix up some on a disposable service and spread it onto part of the headlight unit and up to the projector. Don't go overboard with this stuff you only need enough to grab it because once this stuff dries its hard as metal. Do not get any on the metal ring that you unscrew to get the bulbs out. Step 7. After the JB-Weld dries clean off your projector lens with rubbing alcohol and the rest of the interior of the headlight for good measure. Snap in your shroud after cleaning that as well. 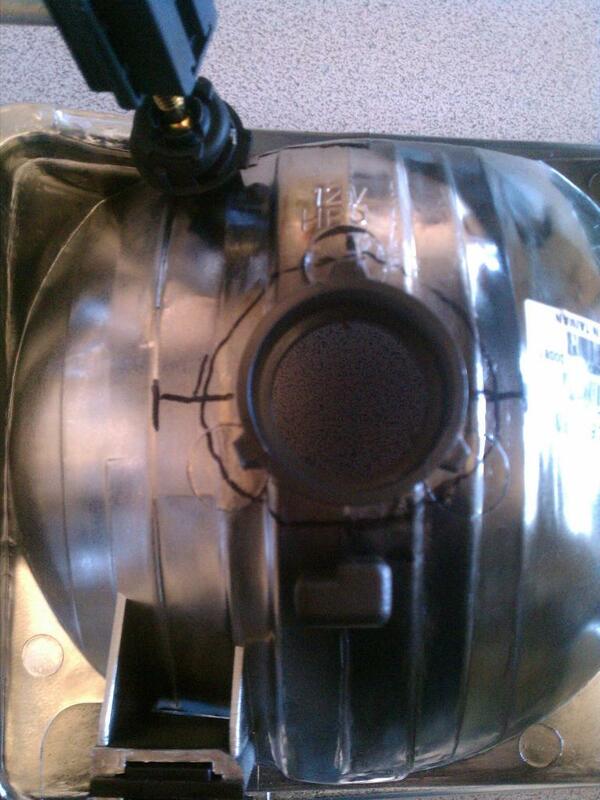 Grab your tube of silicone and fill the recessed portion of the headlight unit. Press the lens in firmly and tape it in as many places while keeping pressure on it. I added more silicone as I went to make sure it was sealed well. Once it dried I even went around again. Many professional modders use butyl rubber to reseal the headlights. I do recommend this because in my mind it is the correct way to do it. Step 8. Your almost home free. Headlights are sealed and wiring is already hooked up. Now it is a plug and play project. Remove your old headlights if you haven't already and simply install your brand new projector units. Double check your cutt-off is at the correct height. Take them for a test drive at night and enjoy the expanded field of view! 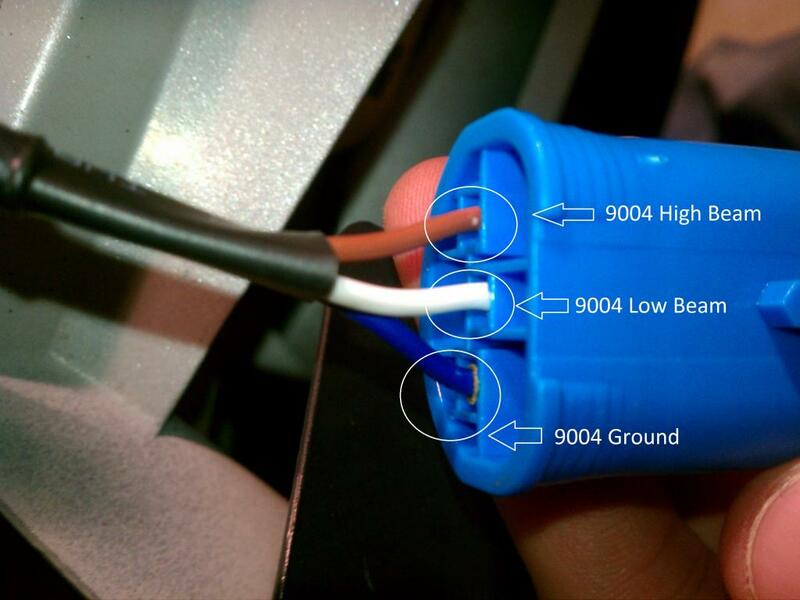 Where did you connect your projectors solenoid? I wired everything up, low beams worked. When i pushed the turn signal stick forward to turn om high beams, the lights shut off. When i pull the stick back, it then activated the solenoid and i had high beams. is the wiring harness incorrect on mine, as well? Headlight AND foglight HID projectors, do I really need them? Who had retro fit HID projectors?